The conclusions drawn from the sedimentation experiments presented on the video Drama in the Rocks are reiterated and defended. The experiments invalidate the identification of superposed rock strata with successive sedimentary layers and thus also the principles of superposition and continuity upon which the geological time-scale was founded. They shed light upon the mechanism of stratification and also show that bedding plane partings are not necessarily sedimentary hiatuses, but could be due to dessication. Thus sedimentation experiments are valuable aids in ascertaining the relationships between hydraulic conditions and stratification, and can be appropriately extrapolated to explain deposition of sedimentary rock layers. Hoskin1 has read the reports of my first sedimentation experiments on the study of lamination,2,3 and of those with my colleague Pièrre Julien in the United States on the study of stratification.4 He has also seen the video Drama in the Rocks5 in which he considers that I have extrapolated inappropriately the mechanism shown by our experiments for the formation of fossil-bearing rocks during the Noahic Flood. I thank him for the acknowledgment. His praise adds to that expressed in dozens of letters emanating from geologists from many countries who have read the reports and, in particular, have seen the video Fundamental Experiments on Stratification.6 This latter video was presented at three successive Congresses of Sedimentology, international, national and European, as well as at creationist congresses. It has since been integrated into Drama in the Rocks. In replying I will refer to the headings Hoskin uses in his paper. ‘The mechanism of laminae formation is thus henceforth referred to as the mechanism of non-horizontal layers’. This expression of his comes from his reading of Julien et al’s flume experiments. He uses it throughout the article for his questions and arguments. It represents, however, a partial view of our experiments, and only refers to the oblique lamination of the delta. This is the true mechanism of our flume experiments, and is that which the experiments set out to show. It was also shown in my original experiments. Similar to most Christians, I became aware in my youth of the contradictions between the biblical Genesis and the Theory of Evolution. I was also aware that the latter was seemingly evidenced by stratigraphy. ‘Each layer [stratum] has the same age at every point’. The fact that the words ‘stratum’ and ‘layer’ are used indiscriminately indicates that the founders of stratigraphy, not having observed the deposition of successive layers of sedimentary particles, had arbitrarily identified superposed rock strata as successive sedimentary layers. Julien et al.’s ‘abstract’, quoted above, shows clearly the distinction that must be made between strata and layer. It is the mistake of identifying layers as strata that has been highlighted experimentally. Thus the principles of superposition and continuity are refuted by experiment. Scientists generally acknowledge that a principle invalidated experimentally must be abandoned, because it loses its character of universality. If, therefore, in a sedimentary rock, the stratification is inclined at an angle less than 30°, it should not be concluded that the stratum was deposited horizontally, and that its inclination results from either a tectonic uplift or the effect of subsidence. The true mechanism of sedimentation revealed by our flume experiment refutes, inter alia, the foundations of the geological column, and therefore, challenges the geological time-scale. This statement is absolutely correct and demonstrates that sedimentologists have studied sedimentation and continue to make discoveries both by underwater sedimentary observations and by experiments. Reference can be made to Southard and Boguchwal14 who give a recapitulation of recent data sources from flume studies. What distinguishes our experiments from others, however, is that they have questioned the identification of strata and layers, and thereby the principles of stratigraphy. Thus, if agitation of water exists at depth, due in particular to the presence of lateral currents, stratification in the deposit should be observed, as its structure is a function of the hydraulic conditions. This is what Rubin and McCulloch16 observed in San Francisco Bay, as depicted in Figure 1. Figure 1. 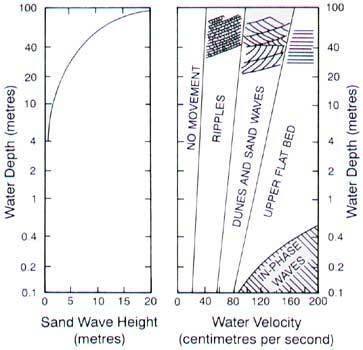 Graphs of water depth versus sand-wave height, and water depth versus water velocity, showing bedforms in fine sand expected under different water conditions. The thickness of cross beds observed in fine-grained sandstone is used to estimate sand-wave height. Then, sand-wave height is entered into the graph on the left to estimate the water depth where the sand wave formed. After a water depth is estimated on the left graph, that depth is transferred to the right graph, where the minimum-and-maximum velocities of water are indicated for the specific water depth. of his Grand Canyon: Monument to Catastrophe17 to determine the lateral currents at a given depth that had generated the ‘cross-beds’ in the Coconino Sandstone and other rock units of the Grand Canyon. He determined an interval of speed from 90 to 155 cm/s. He recalled that currents of 150 cm/s have been observed near Norway, more than 100 cm/s in the Mediterranean, and 250 cm/s in San Francisco Bay. These are hydraulic conditions quite comparable to those of our experiments, and those of all the flume experiments. It follows, therefore, that there is no reason to restrict their application to ‘shallow waters’. Rubin and McCulloch’s diagram (see Figure 1) clearly shows that at different depths, and according to their speed, lateral currents produce deposits with various stratified configurations. These functional relationships between hydraulic conditions and stratification result from observations and experiments. An examination of the stratification of sedimentary rocks should, therefore, enable the hydraulic conditions which existed during the formation of the rocks to be established, at least within certain limits. Steve Austin applied this method to Grand Canyon rocks. To better understand the change that such a methodology represents, it should be borne in mind that one of the bases of stratigraphy, the principle of continuity, excludes the operation of a lateral current. If there were such a current the resultant sedimentary layer would prograde downstream, and therefore would no longer have the same age at each point. The marine transgressions and regressions that geologists have determined are supposed to have taken place over millions of years. In order not to contradict the principle of continuity, therefore, the speed of the lateral currents would need to have been virtually zero. Geologists are now obliged to abandon the principles invalidated by our experiments, in particular the principle of continuity, and subscribe to the new methodology mentioned above. Our experiments, as with all those of the past and the future that are accompanied by underwater observations, will help to develop this comparative methodology between contemporary sedimentology and stratigraphy. It is clear that this methodology should be integrated into today’s sequence stratigraphy. This relatively modern science has its roots in the observations of facies of contemporary marine sediments made a century ago by Johannes Walther.19,20 As shown below, this science is obliged to take our experiments into account. As already shown, this ‘mechanism’ was an interpretation by Hoskin, which does not correspond to the conclusions of our experiments in the published reports. A schematic presentation of the basic terms of classical stratigraphy, that is, laminae, strata, facies graded-beds, bedding plane partings and sedimentary layers. The law applies to progradation of sediments, transgressions and regressions. The video gives illustrations of the application of these movements to both coastal sediments and deep sea sediments. The latter accords with the published data from the ‘Glomar Challenger’ drilling programme. Visualisation of our experiments in France and in the United States. These include the flume experiments, showing superposed strata depositing at the same time, which confirm Walther’s Law. My own comments, in which I emphasise that our experiments invalidate the basis of the geological time-scale. Some of my remarks are based upon sequence stratigraphy, and not on the results of our experiments, although the latter have an indirect application. It should be noted that the experiments liberate sequence stratigraphy from the limits of bedding plane partings. The latter need no longer be considered as chronological markers, arising simply from sedimentary hiatuses. It is shown that they can arise by desiccation subsequent to the deposit, and therefore have no chronological significance. Considering the possibility that the sedimentation giving rise to sedimentary rocks could have resulted from successive tidal waves moving across the oceans, as I suggested in Drama in the Rocks, does not seem to me incompatible with the Noahic Flood. The recognition by Steve Austin of lateral currents of 90 to 15 cm/s at the time of formation of cross-beds in the Grand Canyon lends some support to the hypothesis. The determination of initial hydraulic conditions from the stratification of rocks, in association with sequence stratigraphy, should, I think, shed light upon the problem of compatibility of the Noahic Flood with the new stratigraphy. (1)	Once again Hoskin uses his own interpretation of the mechanism of non-horizontal layers to see if it can account for the stratification of the Grand Canyon. He thinks not, and asks whether in fact ‘sedimentation would not operate many times on small packages of sediments’. The response to this dilemma does not come directly from our experiments, but rather more from sequence stratigraphy. Knowing that a transgressive series corresponds from bottom to top to a superposition, such as sandstone-siltstone-shale-limestone, and the reverse position for a regressive series, an analysis of the geologic block diagram of the Grand Canyon25 starting from Tapeats can be made. First, a marine transgression from Tapeats to Redwall, followed by a regression from Redwall to Supai. Then comes a transgressive-regressive cycle from Supai to Coconino, followed by a final transgression prior to the waters retreating. McKee26 made an interesting study of the Supai Group to determine the directions of the currents corresponding to these transgressions and regressions. The transgressive and regressive series follow Walther’s Law. The direction of the current, and to some extent its speed, can be ascertained from the slope of the cross-stratification in the sandstones (Tapeats, Supai, Coconino). This speed is highly variable and determines the sizes of the deposited particles. Graded-beds are created in these conditions, with the sediments depositing upward and downstream. Figure 2. Diagram of a marine transgression showing the sequential deposition of the various facies. The Figure 2 is a diagram by Vincent27 of a marine transgression. When the ocean is at A, the sedimentary layer deposited is a; when at B, b; when at C, c. In a vertical direction from A, the deposit of pebbles, sandstone and marl superpose when the ocean level is at C. But when the ocean level is at C, the pebbles deposit at C, the sandstone at B, the marl at A. The diagram illustrates Walther’s Law of Facies: pebbles, sandstone and marl are seen to be superposed and juxtaposed in the area of the deposit. It is in this way, therefore, on the scale of facies, that stratification in the Grand Canyon has to be interpreted. (2) and (3) Hoskin mentions the case of juxtaposed rocks having different stages of oxidation and different cements. This seems to be a question of chemical action having taken place subsequent to sedimentation, which would accord with Walther’s Law. (4) Hoskin then refers to evaporitic salts. Again I would refer him to Walther’s Law. These salts occur in shallow waters which arise in the final stage of a transgressive series, or the first stage of a succeeding regressive series, following Walther’s Law. (5) I have read the report of the Boguchwal and Southard experiments showing the incidence of temperature on the conditions of sedimentation.28 In our experiments we did not vary the temperature, although I agree that it could have had some effect. It would not, however, have fundamentally altered the results obtained. Aubouin29 specifies that graptolites are mainly found in schists, which under tectonic strain produce an axial-plane foliation which coincides with the bedding planes. Thus, joints in schists would result from mechanical action of strain rather than from desiccation. Why graptolite fossils are found in these joints or cracks remains to be explained. I don’t know. Hoskin’s two final questions can be summarised as follows: why, if bedding plane partings result from desiccation, do they occur in the middle of large uniform deposits? The same question can, of course, be asked regarding vertical cracks found in sandstone and limestone. I have never said that desiccation is the only factor creating bedding plane partings. But the postulate of stratigraphy that these partings are sedimentary hiatuses has been shown by my experiments to not necessarily apply. Desiccation has been shown experimentally to be a factor. In my view it is wiser to rely on observable repeatable experiments than on interpretations unsupported by facts. Our experiments have invalidated the identification of superposed rock strata with successive sedimentary layers. Consequently, the experiments invalidate the principles of superposition and continuity upon which the geological time-scale was founded. They shed light upon the mechanism of stratification. Our laboratory work contributes to discoveries in sedimentology in the domain of observation and experimentation. Our new series of experiments currently taking place, has as its objective for 1997–1998 the development of an understanding of sedimentary mechanics. Despite what is said to the contrary, ‘the present is the key to the past’ if contemporary sedimentary mechanisms can be used to explain those which created the sedimentary rocks. The first contribution to sedimentology came from Johannes Walther, whose observations of contemporary sedimentation led to sequence stratigraphy and the recognition of transgressive and regressive series. Our flume experiments demonstrate that Walther’s Law, which applies to facies series, also applies to the internal strata of facies. The experiments have also shown that bedding plane partings are not necessarily sedimentary hiatuses, but could be due to desiccation. In which case, it would mean that there would be no discontinuity between superposed sequences. These facies series have up until now only been studied locally. No account has been taken of their relationship with each other. A marine transgression or regression, however, should be recognisable throughout its extent wherever it deposited its sediments. This is why observations, such as those of Rubin and McCulloch, and those in our flume experiments, ascertaining the relations between hydraulic conditions and stratification are so important. It is from them that the stratification of rocks can, within certain limits, determine the initial hydraulic conditions at depth, and the speed and direction of transgressive and regressive currents. With the aid of sequence stratigraphy, the entire extent of these transgressions and regressions can be reconstituted, as well as their succession in time. Taken together, all of this provides a more exact view of the history of geological time. When, therefore, in the video I spoke of successive tidal waves, it was certainly in anticipation of the results of this reconstitution. This anticipation, however, which is coherent with the results already known that I have recapitulated above, does not, in my opinion, merit the term ‘extrapolation’. Regarding the Noahic Flood, might not these successive tidal waves result from ‘the fountains of the deep’? Hoskin, W., 1997. Sedimentation experiments: is extrapolation appropriate? CEN Tech. J. 11(1):61–64. Return to text. Berthault, G., 1986. Experiments on lamination of sediments. Compte Rendus Académie des Sciences Paris t.303, Série II, no. 17:1569–1574; and EN Tech. J. 3:25–29 (1988). Return to text. Berthault, G., 1988. Sedimentation of a heterogranular mixture: experimental lamination in still and running water. Compte Rendus Académie des Sciences Paris t. 306, Série II:717–724; and EN Tech. J. 4:95–102 (1990). Return to text. Julien, P. Y., Lan, Y. and Berthault, G., 1993. Experiments on stratification of heterogeneous sand mixtures. Bulletin of the Geological Society of France 164(5):649–660; and CEN Tech. J. 8(1):37–50 (1994). Return to text. Berthault, G., 1995. Drama in the Rocks. Video, Creation Science Foundation Ltd, Australia. Return to text. Julien, P. Y. and Berthault, G., 1994. Fundamental Experiments on Stratification. Video, Sarong Ltd, Monaco. Return to text. Julien et al., Ref. 4, p. 37. Return to text. Berthault, Ref. 2. Return to text. Berthault, Ref. 3. Return to text. Julien et al., Ref. 4. Return to text. Julien and Berthault, Ref. 6. Return to text. Southard, J. B. and Boguchwal, L. A., 1980. Bed configurations in steady unidirectional water flows. Part 2. Synthesis of flume data. Journal of Sedimentary Petrology 60(5):658–679 (Table I). Return to text. Berthault, Ref. 3, p. 100. Return to text. Rubin, D. and McCulloch, D. S., 1980. Single and superposed bedforms: a synthesis of San Francisco Bay and flume observations. Sedimentary Petrology 26:207–231. Return to text. Austin, S., 1994. Interpreting strata of Grand Canyon. In: Grand Canyon: Monument to Catastrophe, Institute for Creation Research, San Diego, California, pp. 21–51. Return to text. Rubin and McCulloch, Ref. 16, p. 207. Return to text. Walther, J., 1893–1894. Enleitung in die Geologie als historische Wissenschaft, Iena Verlag von Gustav Fisher, three volumes, 1055p. Return to text. Walther, J., 1910. Die Sedimente des Taubenbank in Golf von Neapel, Berlin-Akad. Wiss Abh könig — press, 49p. Return to text. Walther, Ref. 19. Return to text. Walther, Ref. 20. Return to text. Middleton, G., 1973. Johannes Walther’s law in the correlation of facies. 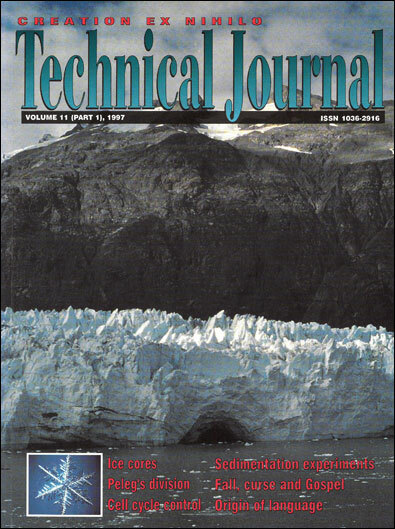 Geological Society of America Bulletin 84:979–988. Return to text. Froede, C. R. Jr., 1994. Sequence stratigraphy and creation geology. Creation Research Society Quarterly 31:138–144. Return to text. Austin, Ref. 17. Return to text. McKee, E. D., 1979. Characteristics of the Supai Group in Grand Canyon, Arizona. In: Carboniferous Stratigraphy in the Grand Canyon Country, Northern Arizona and Southern Nevada, S. S. Beus and R. R. Rawson (eds), American Geological Institute, Fall Church, Virginia, pp. 110–112. Return to text. Vincent, P., 1962. Sciences Naturelles, Vuibert. Return to text. Boguchwal, L. A. and Southard, J. B., 1990. Bed configurations in steady unidirectional water flows. Part 1. Scale model study using fine sand. Journal of Sedimentary Petrology 60:649–657. Return to text. Aubouin, J., 1967. Précis de Géologie, Dunod, Tome I, p. 413; Tome II, p. 130. Return to text. Guy Berthault is a graduate of the Ecole Polytechnique, France, and a keen student of geology, particularly the deposition of sediments as a guide to the understanding of structures that we find in sedimentary rocks. He resides in Paris (France). Return to top.